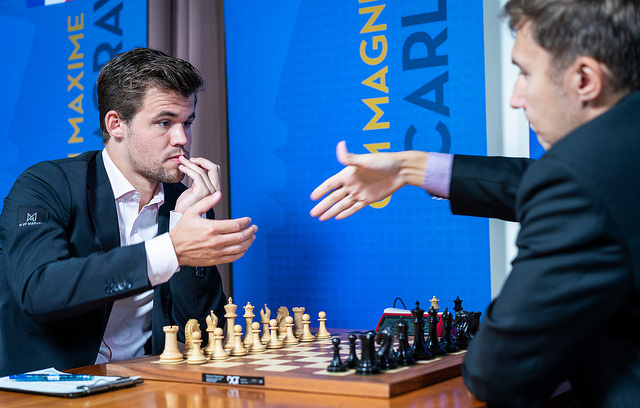 Magnus Carlsen joined Shakhriyar Mamedyarov and Levon Aronian in the Sinquefield Cup lead after winning an 88-move, near 7-hour marathon against Sergey Karjakin in Round 2. 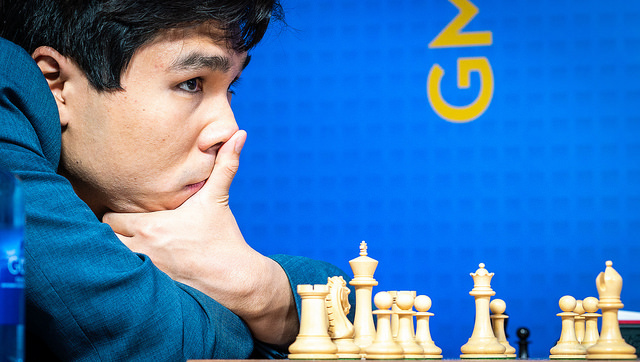 Magnus ramped up the pressure in what initially looked like a harmless position, but Sergey blundered only in time trouble when it seemed he was about to escape. Before that drama it looked as though we were in for a short day, since the remaining four games ended in sometimes lively, but relatively quick draws. Go Premium using the voucher code SINQUEFIELD2018 when purchasing a 1-year membership and get 3 extra months free! 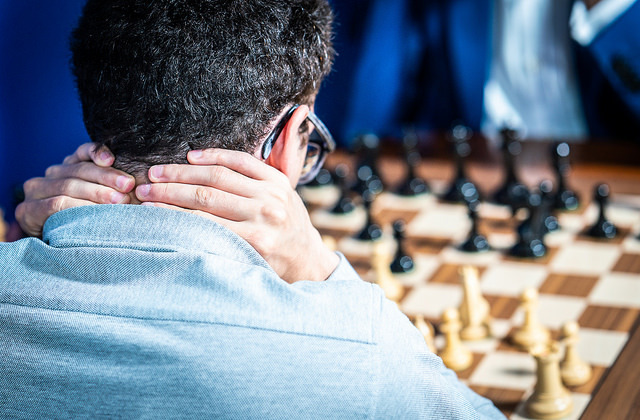 After long, complicated battles in Round 1 it looked as though the players, consciously or subconsciously, wanted to take things easier, as four of the games ended without ever fully sparking into life. Hikaru Nakamura was the high-octane star of the St. Louis Rapid and Blitz, but, with no need to worry too much about Grand Chess Tour qualification, he’s taken things easy so far in the Sinquefield Cup. In Round 1 his game against Vishy Anand ended in 29 moves, with the arbiter allowing a draw in a dead drawn position despite no repetition being reached. The players slipped away without being interviewed, though Anand had made a confessional appearance. His conclusion was that 10.Qa4 is White’s best try for an advantage, while 10.Qc2 “does not pose any particular problems”. Thus it proved in the game, since after some thematic moves a simple draw was soon reached. The other games all had more of a spark about them, and some entertaining post-game interviews. Vishy Anand and his second Grzegorz Gajewski decided to take aim at one of Maxime Vachier-Lagrave’s pet lines in the Najdorf, with all the moves up to 15.Bd3 having been seen in Giri-MVL from the 2017 Palma de Mallorca Grand Prix, and much more recently just a week ago in St. Louis in the Caruana-MVL rapid game, where Maxime was better early on but Fabiano missed a big winning chance later in the game. He’s very predictable, or he’s very stubborn about this line, and that gives you a target, which we tried to use. They take it personally! I don’t. It’s been a lot of times now that I’ve been tested in this line, and rightfully so, because so far I haven’t been able to get safe positions out of it… I understand why they would pick a fight there - you have to look for your opponent’s weaknesses. 24.Bb4!? was a move Vishy later said he regretted, since after 24…Bxb4 25.axb4 a5! Black was able to free himself and the game soon ended in a repetition. Vishy instead suggested 24.b4 and playing for a long-term advantage, but the plan MVL gave of responding 24…Rc8 25.Rh3 Qc7, and following up with Qc7-c4 and Bd8-b6, looks strong. I could tell that he was a bit surprised, and I guess he decided on the Slav over the board, and I decided to surprise him as well. 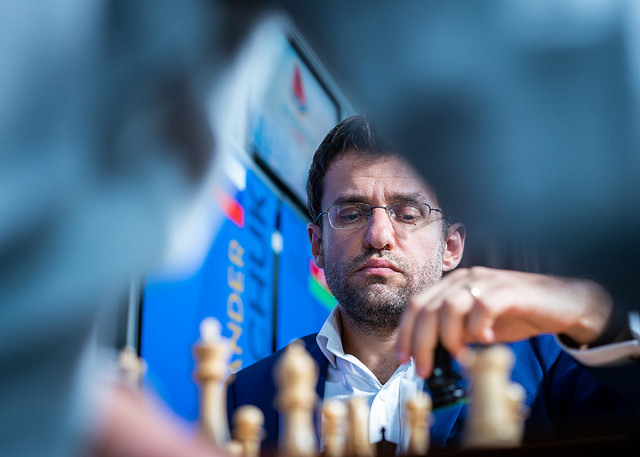 His game the day before had been against Alexander Grischuk, who quipped after a draw against Shakhriyar Mamedyarov, “Yesterday I played the no. 2 player in the world, and today I played the no. 2 player in the world!” Some on Twitter noted that it’s not impossible he can play the world no. 2 again later in the tournament, though only if Magnus loses some games. I think in my notes I have this line written as a joke line – it looks so bad for Black! I just have “French Defence joke line” and yeah, I looked at it, and I thought ok, maybe at some point I will play it with Black, but it looked so bad. But actually with White it’s not that easy. The computer here suggests 19…e5! 20.Nxe5 Be6 for Mamedyarov, a pure pawn sacrifice in exchange for powerful piece play. 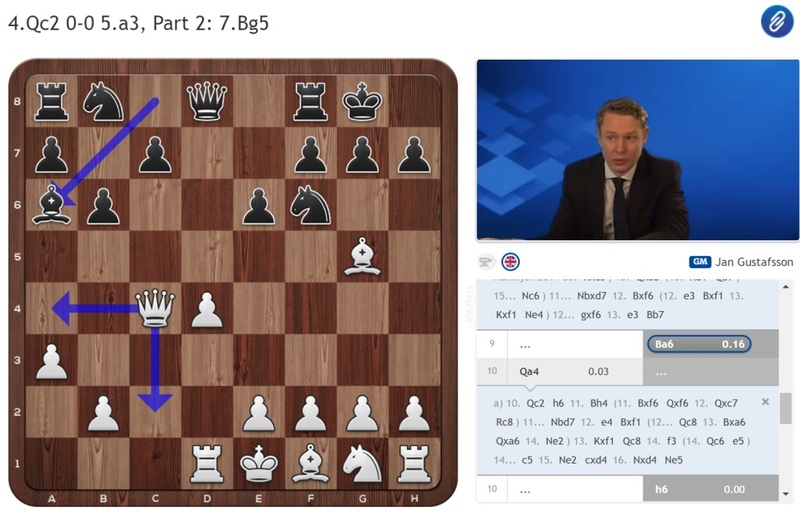 That would be a big decision for a human to take, of course, and after less than 4 minutes Shak went for 19…Bd7 instead. Grischuk then had nothing better than forcing a repetition with 20.Nf6+ Kf8 21.Nh7+, with Mamedyarov compelled to accept. 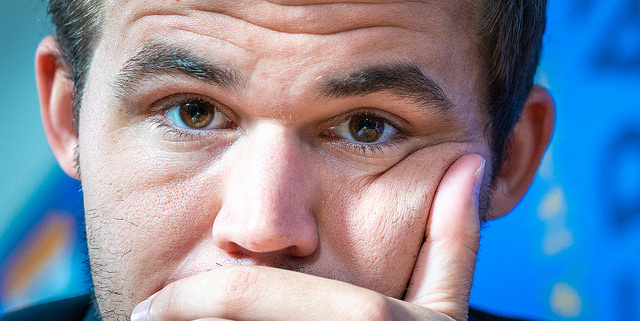 When Magnus Carlsen rose to the top of world chess and achieved the highest ever rating it was all about a particular kind of win – grinding his opponents into dust from the most innocuous of beginnings. We haven’t seen so much of that Magnus in recent years. Partly it’s because his opponents have got younger and used to the style – after all, they’ve also adopted the plan of playing opening for no more than a “playable position” themselves – but there’s also a suspicion that Magnus himself doesn’t have quite the same intense drive and precision required to crush souls on a regular basis. Only once in the latest World Championship match did he manage to pull off the trick against Sergey Karjakin, and in that case it was marred by allowing an instant tactical draw early in the game. I thought it was just a little bit better and I was kind of hoping to be able to sac the exchange at some point. Then I feel like he played inaccurately because I got basically the perfect conditions to sac the exchange, since I either get one pawn back immediately or the g5-break. After that it should be a draw, but it’s awfully unpleasant, of course, so I think he defended well for a while, then maybe he played a bit inaccurately and I think I had some serious winning chances, but then I think my Bb6 move at some point was pretty poor, and then I felt that it had slipped away, but I could see it coming from a long way that we were both going to get down to the delay, and then I was kind of nervous about it. I felt that it would be very, very hard not to blunder, and that’s what happened! After using three minutes of just five remaining, Sergey finally went for 67…g5+!, which objectively seemed to solve his problems, although Magnus observed that it did end up giving White a passed e-pawn. Svidler had just mentioned that Sergey was playing quite loosely when disaster struck, but the more you play around with “solidifying” moves, such as putting a rook on e6, the more you realise you can only maintain a blockade based on tactical nuances. 80.Rxa6? here would throw away the win to 80…Re1+, a saving resource in many lines, but here Carlsen had 80.e6! and eight moves later the e-pawn had won the day. I’m very happy to win, and I’m objective enough to realise that when we’re both getting short on time then it’s going to be hard to play perfectly. I understand very well that I made mistakes in this game, but I will not blame myself for it. I feel like I just did everything I could, and sometimes it’s enough, sometimes it isn’t. 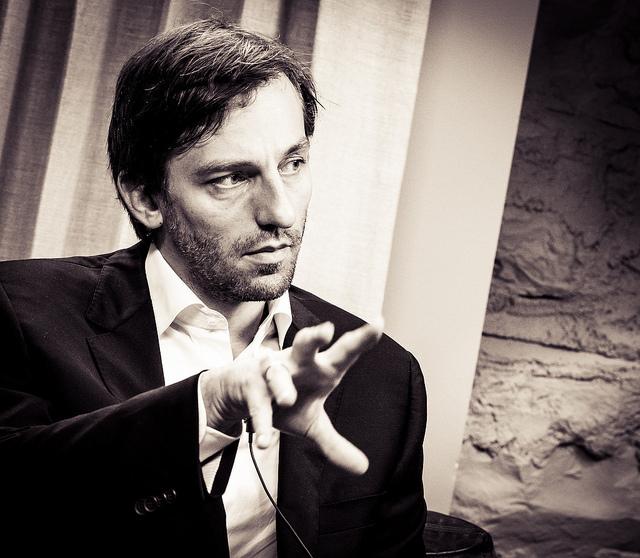 For Sergey it was a second painful loss in a row, with Svidler and Miroshnichenko asking the producers not to invite Karjakin this time – they’d been surprised when he turned up the day before after the first loss and didn't want him to suffer any more. Karjakin now has White against Vishy Anand, while Magnus will want to regain his energy fast before a big clash with the black pieces against Levon Aronian. 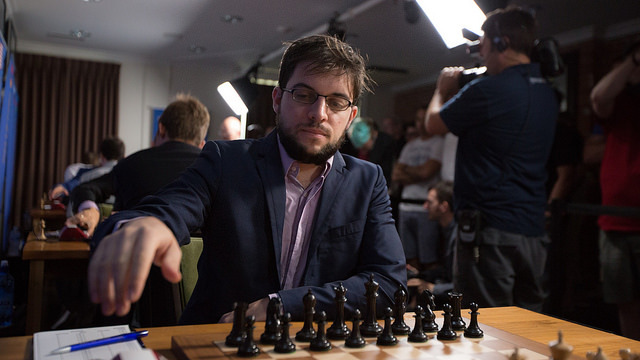 It promises to be a fascinating day, with Mamedyarov-Caruana a chance for Fabiano to regain the world no. 2 spot – or for Shakhriyar to surge ahead yet again. Watch all the action live here on chess24 from 13:00 local time (20:00 CEST)!